tags: Hell Has No Fury...Like A Woman Transformed. 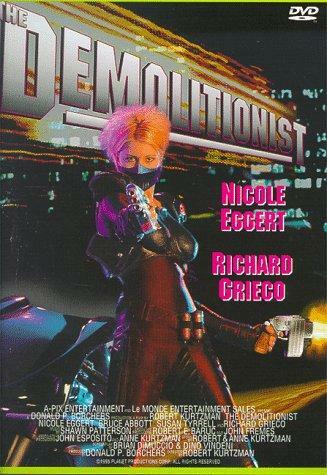 A murdered police officer is brought back to life by a cold-hearted scientist to serve as "The Demolitionist", the ultimate crime-fighting weapon in a city overrun by criminals and internal corruption. Overall, not a bad film but not that good either. Shades of Robocop here, a bit of Borg technology there, but I thought it failed to gel into an enjoyable whole. Richard Grieco was nasty, but not nasty enough. The mayor was a joke. The acting on the whole was below par. The heroine wiped out the bad guys too easily (doesn't she ever reload?). She should have at least been stabbed or shot a few times to show her super quick healing powers in action. No chance of that though with her armour. I guess given a low budget they didn't do too badly, but the outcome was merely average. Watch out for the grisly ending! This movie has no redeeming value. If it is a satire then why did they plan sequels? Only good satire has sequels, and then rarely. The effects are bad. The guns she uses never have to reload. She's impervious to grenades. The acting is some of the worst ever captured on celluloid. It's just plain bad. I wish I could give it a negative rating.